If you ask the males in our household which they would rather have for their dessert, cake or pie, they would probably say “pie” about 95% of the time. So when I brought the subject of a pie challenge up to Doug his eyes lit up like a Christmas tree in a Chevy Chase movie. I plan to feature a different pie every week for the next 52 weeks. Pretty big deal huh? If you have a favorite pie recipe that you would like me to try out in the next 52 weeks please feel free to e-mail me at marymargaretripley@yahoo.com with your recipe and story (I love a good story behind a recipe) and I will try it out and feature it on the blog if all goes well. 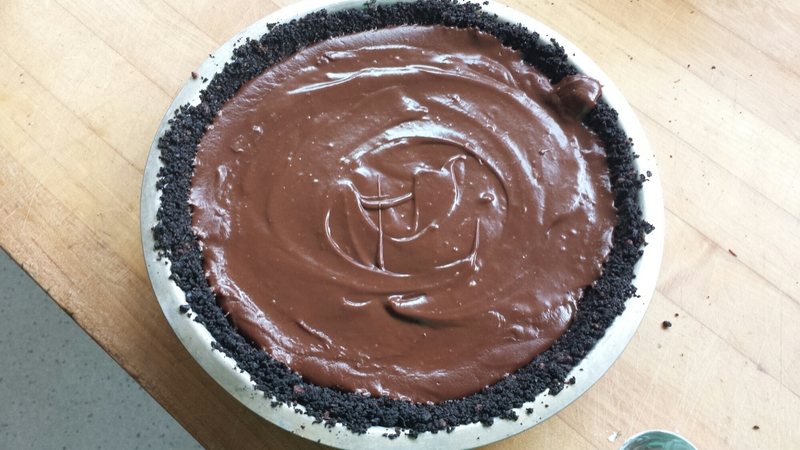 With that, here is the How-to and recipe for Week #1 Mississippi Mocha Mud Pie. Enjoy! 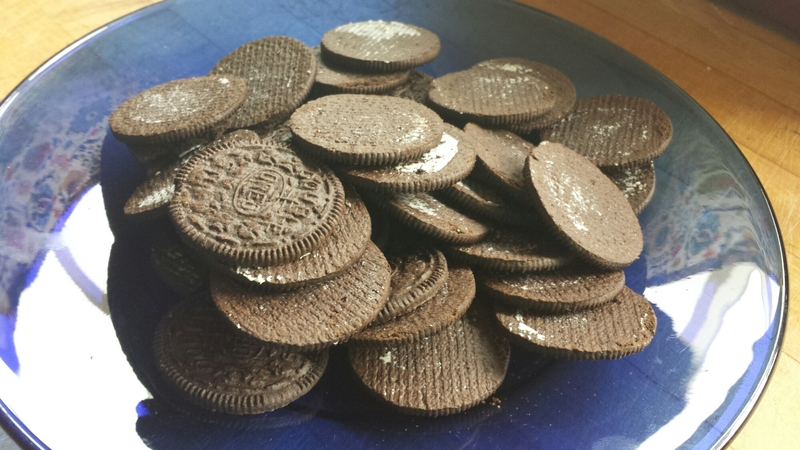 Start with 18 Oreo cookies, fillings removed. 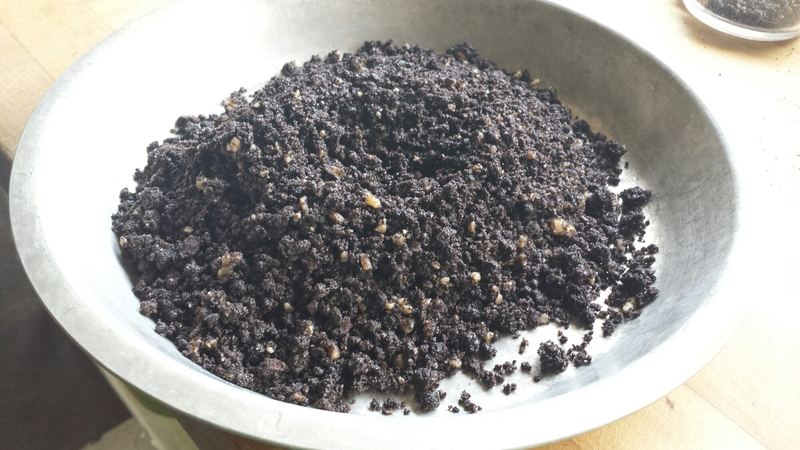 Grind along with a 1/4 cup of chopped pecans and 1 Tbsp of sugar in a food processor or mini-chopper. 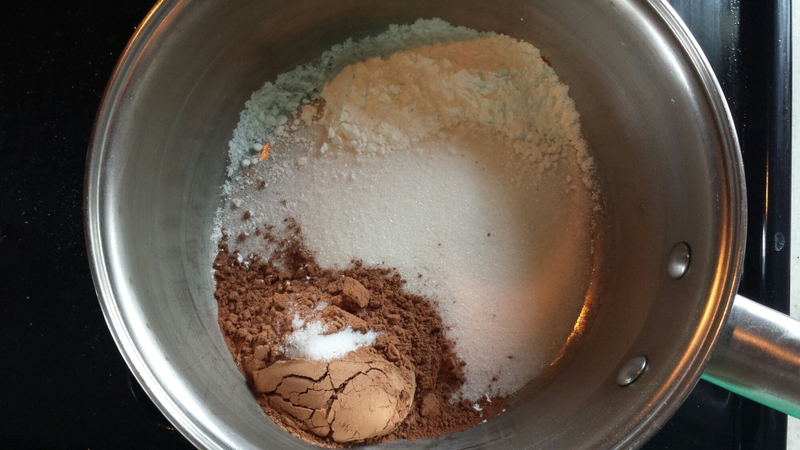 Remove 3 Tbsp of mixture and set aside to use as a garnish later. Press remaining mixture into the bottom of a 9″ pie pan and bake at 375 degrees for 10 minutes. Remove from oven and cool. 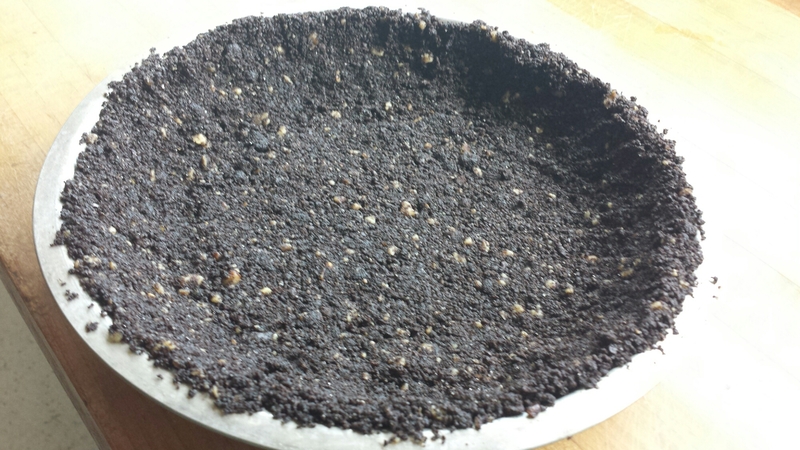 No wonder they call it a mud pie it looks like potting soil! 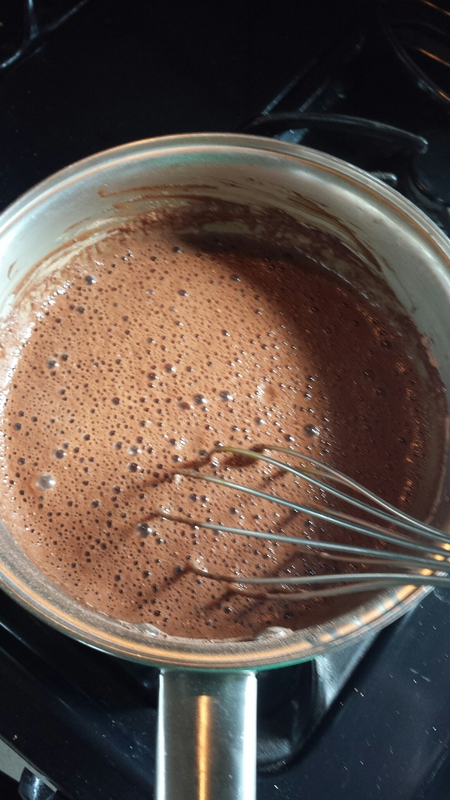 For the filling, using a medium saucepan, whisk together 3-1/2 Tbsp of cornstarch, 1/2 cup sugar, 1/3 cup unsweetened cocoa powder, and 1/4 tsp salt until combined well. To the above dry ingredients add 3 large egg yolks, 1-1/3 cups of milk (I only had 2% on hand but the original recipe calls for whole) and 1/3 cup of brewed coffee. Whisking all of the wet and dry ingredients together in the saucepan, place over medium heat whisking constantly until it begins to boil. 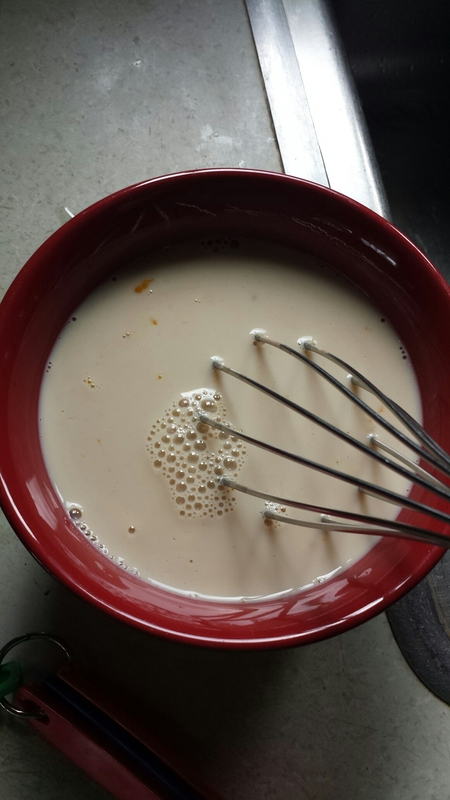 As it starts to boil it will get thicker and harder to whisk but keep whisking for another 30 seconds after it starts. Remove from heat. 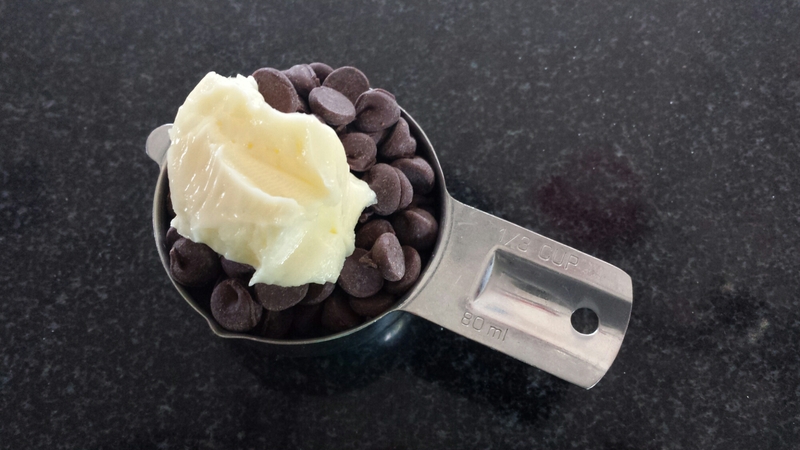 After removing from heat immediately add 2 Tbsp butter, 1/3 cup of semi-sweet chocolate chips, and 1-1/2 tsp of vanilla. 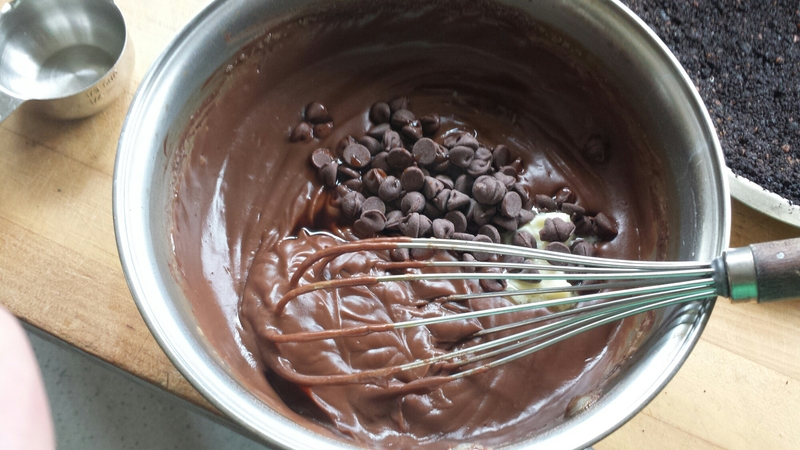 Whisk together until the butter and chocolate have melted and the whole mixture is smooth and silky. Pour the filling into the cooled pie crust and cover with plastic wrap. Chill it in the fridge for at least 4 hours or overnight. Looks great already doesn’t it? Before serving the chilled pie, top with whipped cream. Combine in a stand mixture or use your handy dandy hand mixture, 1-1/2 cups of heavy whipping cream, 1-1/2 Tbsp powdered sugar and 1 tsp of vanilla. 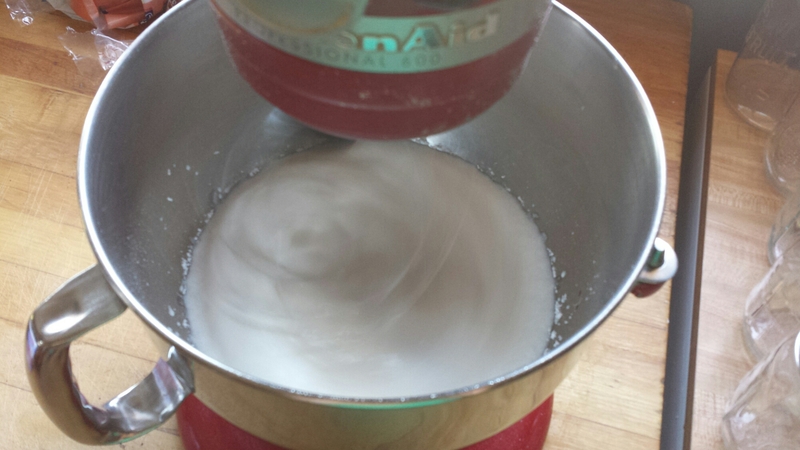 Whip until soft peaks form. Spread the whipped cream over the top of the pie and if you like you can pipe it on with a pastry bag like I did. Sprinkle the toasted pecans and reserved cookie mixture over the top of the whipped cream and drizzle chocolate sauce over all of it. Yum! Over all this recipe trying it for the first time was fantastic! There are a couple of things I think I would tweak though. One being, add more filling. I would have liked it a little fuller. Either that or use an 8″ pie pan instead of a 9″ pie pan. Two, I used walnuts instead of pecans and I wished I had used the pecans. Three, I really didn’t taste a lot of the coffee so next time I will use a stronger brew. Four, I will chill it overnight. It was even better the next day . This was one of the easiest cream pies I have ever made and I hope to use these same methods with other cream pies. I have never put the egg yolks directly into the mixture while it was cold. Most recipes and methods call for putting half of the hot mixture into the egg yolks separately then dumping the whole egg mixture back into the original mixture. 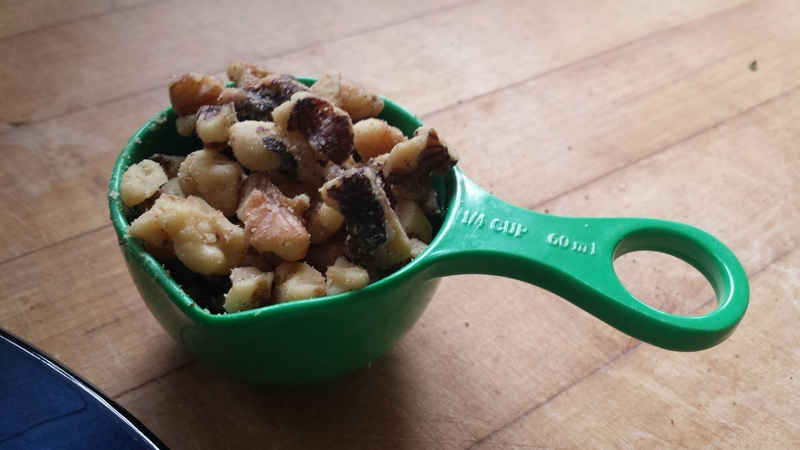 This recipe eliminated that extra step and it worked beautifully! As far as the taste and how it went over with the guys? Scott gave it two thumbs up and Doug…well he likes banana cream pies better. Ha! Next time Doug! 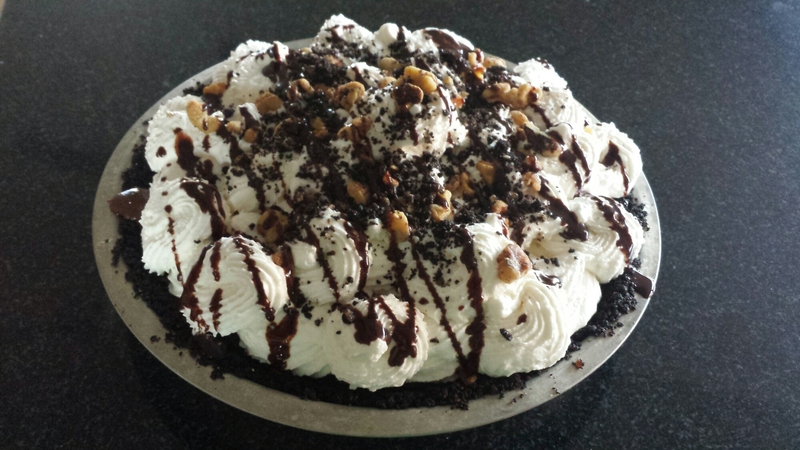 This entry was posted in 52 Week Operation Pie and tagged 52 week pie challenge, Mississippi Mocha Mud Pie, Mocha, Mud Pie, Spiced-One Dash at a Time by marymargaretripley. Bookmark the permalink.